Short (71 words): T. R. Robinson is an independent author of memoir, autobiography, biography and fiction all of which are based upon life experiences; hers and others.Though born into a loving family she eventually suffered war and abuse and subsequently married and moved to England. Following her divorce she had various employments ranging from managing small electrical components, laboratory assistant, hospital orderly, waitress and much more between. Her writing career commenced in 2013. Medium (180 words): T. R. Robinson moved to England after her marriage to a British Naval Lieutenant who had been a member of an allied naval force liberating her homeland from occupation. Though she had undergone the degradation and horror of war and torture she has retained her innocent, naive nature which have been constantly taken advantage of through life. Subsequent to escaping, with her young son, from a cruel and abusive husband, she entered the employment arena undertaking a variety of different employments: managing small electrical components, laboratory assistant, hospital orderly, waitress and much more between. Besides the difficult times she has had some amusing incidents in her life. There was the time she and a good friend were invited out to an exclusive country club. Dressed in their finest evening gowns, with best jewellery and coiffures, they ended up face first in mud when the friend’s car decided to stall and had to be push-started. Then there was the time a young man stopped her in the high street, fell to his knees to, as he put it, worship her. 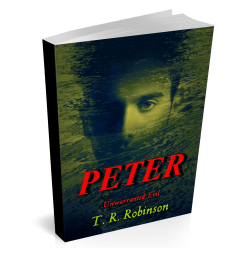 Long (341 words): T. R. Robinson is an independent author of memoir, autobiography, biography and fiction all of which are based upon life experiences; hers and others. She moved to England upon her marriage to a British Naval Lieutenant who had been a member of an allied naval force liberating her homeland from occupation. Despite the degradation and horror of war and torture she has retained her innocent, naive and loving nature all of which have been constantly taken advantage of. Her husband proved to be a cruel and violent man and eventually, primarily for the sake of her young son, she escaped from his grip. Subsequently, having to find the means to support her son and herself, she undertook a variety of different employments: managing small electrical components, laboratory assistant, hospital orderly, waitress and much more between. Though, as apparent, she constantly endured difficult times, she has had some amusing incidents in her life. There was the time she and a good friend were invited out to an exclusive country club. Dressed in their finest evening gowns, with best jewellery and coiffures, they ended up face first in mud when the friend’s car decided to stall and had to be push-started. Then there was the time a young man stopped her in the high street, fell to his knees to, as he put it, worship her. For years she struggled with the concept of writing her story, due to feeling embarrassed and ashamed of all that has been done to her through the years. It was not until she heard details of other peoples lives she came to appreciate her ancestor’s lives as well as her own had been anything but ‘normal’. Though still uncertain readers would be interested she decided it would not be right to allow the tales to be lost to society and therefore went ahead and started publishing. T. R. is the owner of T. R. Robinson Publications through which she aims: to help fellow authors; to provide recommendations for readers; and to organise the publication of her own books. In all books, author T. R. Robinson is honest, utterly truthful and generally uncompromising no matter whether a memoir, autobiography, biography, novel or short story. All are either totally, or in part, based upon actual events. Many of the experiences recorded, their own and that of ancestors and friends, were violent, cruel and painful. Inevitably, descriptions of the perpetrators are ugly, unpleasant and critical and show them for who they really are or where. Though deserving of public exposure, T. R. is not of a vindictive nature and has no wish to impose upset, embarrassment or public shame upon the relatives, decedents or friends of those terrible people. ‘Why should they suffer for someone else’s cruelty’. In view of this desire to protect others, deserving or not, and that many would recognise T. R. from any photograph, this logo has been utilised. T. R. Robinson is an independent author of memoir, autobiography, biography and fiction all of which are based, in whole or part, upon life experiences; hers and others. Synopsises and further information may be found by following this link. The following are responses to T. R.’s memoirs, novel and short stories. What first inspired T. R. to write? For many years T. R. struggled with the concept of writing their story: they were embarrassed and ashamed of what had been done to them. Neither had they considered their life to have been unusual or worthy of publication. However, over the years, many had confided details of their own lives which caused them to realise theirs and that of their ancestors had been anything but ‘normal’. Despite this they remained uncertain as to whether anyone would be interested in reading the tales. Eventually, after much internal debate, they decided to go ahead, considering it wrong to allow the family tales to be lost to prosperity. They acknowledge it was distressing and difficult to recall much of what is shared in the books; ‘Still painful to effectively relive those experiences all over again though they are never forgotten’. That is not to say the books are all negative; lighter, fun filled experiences that will bring a smile to reader’s faces as they do the author’s, are also shared. Do the books convey messages to readers? An unequivocal YES. Readers will see how it is possible to survive, relatively undamaged, the horrors and cruelty of abuse and torture. They will learn how, even if there are struggles, someone may overcome the odds and go on to have a reasonably fulfilled life. How it is even possible to enjoy the fun and entertainment life sometimes offers. They will see how the human spirit (theirs and others) is far more resilient than they may think. They will also see how the education and love given to a child in early life will pay dividends later. There is much more to these tales of overcoming but it would turn this into a lengthy exegesis to try an include all that may inspire and help readers. If desired you may request the above information, together with anything else required, to be sent to you by e-mail.